Item # 312327 Stash Points: 499 (?) This is the number of points you get in The Zumiez Stash for purchasing this item. Stash points are redeemable for exclusive rewards only available to Zumiez Stash members. To redeem your points check out the rewards catalog on thestash.zumiez.com. Give your feet the colorful look they deserve, with the Zine Tried Fushion Black & Tomato Crew Socks. 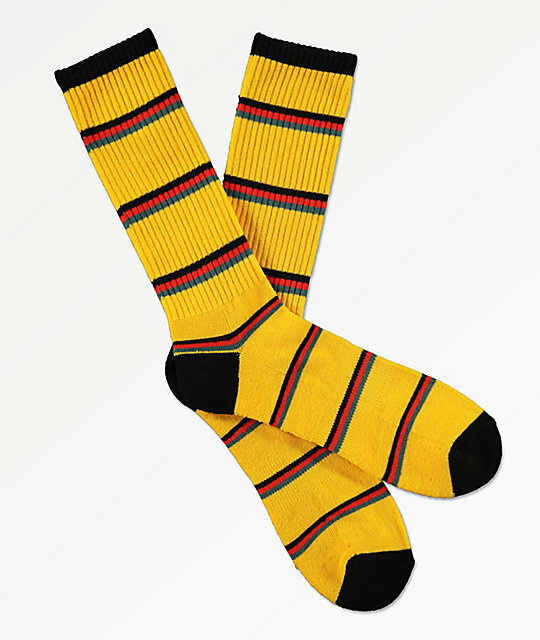 Mostly gold throughout, these socks feature grey, black and red horizontal striping for a splash of pattern. Finished with padding at the contrasting black toe and heel, and additional padding at the arch, these socks will be your most fashionable and most comfortable for sure. Tried Fushion Black & Tomato Crew Socks from Zine. Grey, red, and black horizontal stripes throughout.